You’d think my 100th post would be a cookie recipe, wouldn’t you? Or at least some kind of dessert. But, nope. I like to keep you on your toes. That’s a total lie. The brookies (brownie cookie) that I wanted to post isn’t blog-worthy yet. And, two batches in, I need a break from brookies. Well, my love handles do, anyway. So, instead I give you the spring fling salad, which also happens to be a perfect way to link up to Seasonal Sunday, Brittany’s weekly round up of seasonal recipes, and Diane’s Real Food Weekly, a round up of recipes using whole food ingredients. Oh, and it also happens to be what my friend, Anna, asked me to bring to her Memorial Day weekend cook out. So, what is that – three birds I’m killing with one stone? To prepare, steam the asparagus and broccoli for 5 minutes. Save 3 tablespoons of the steaming water for the dressing. 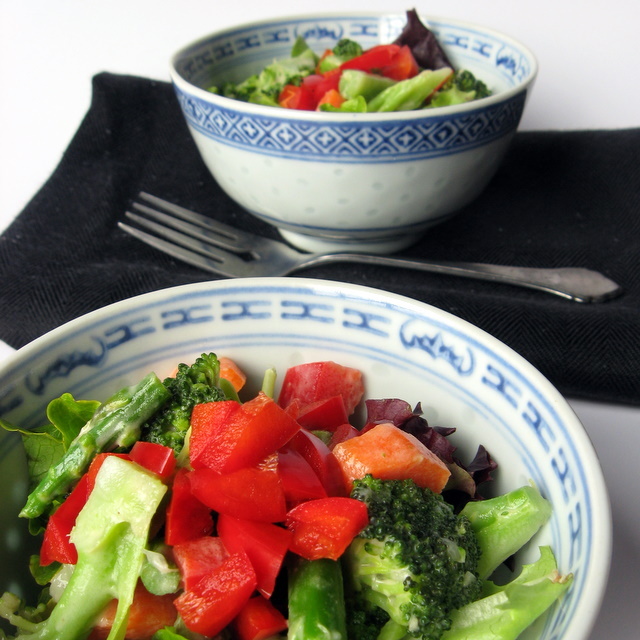 In a large bowl, mix the carrots, red bell pepper, broccoli and asparagus. In a measuring cup, mix dressing ingredients until smooth and creamy. To serve, place a handful of mixed greens on a plate. Spoon on the dressed veggies. Garnish with additional chopped bell pepper, if desired. To make this a vegan main dish, add a can of drained and rinsed garbanzo beans to the dressed veggies. This entry was posted in broccoli, carrots, salads, sesame, side dish, vegan and tagged potluck, recipes, salads, vegan, vegetables. Bookmark the permalink. Happy 100th post! I am coming up on my 100th post too and I’m trying to decide what to write. This salad looks really good – I love how it’s something a bit different from the usual green salad! Happy 100th! We of course need salads to balance out the cookies! Happy 100th post! My first visit to your blog and enjoyed taking a look around. I would love this dish for lunch today so am going to pop to the shop to grab some more tahini right now. It looks so beautiful! Yum! This tahini dressing sounds so good, I’ll have to try it. I love a wonderful fresh salad! Thanks! And thanks for stopping by. I think you’re new around here, yes?